Since Leopard working with somebody on his/her Mac is easy, where ever you are. I love screen-sharing via iChat. The iPhone-SDK is out. Even every-day-media informs us about the SDK. Computer and Internet in your pocket is no fata-morgana any more. Even non-geeks are impressed. You are correct, that the first release for the iphone was based on business dashboards. Reports that give executives a quick overview of their business. These have been very successful and allow both iPhone and iPod touch users keep up to date with what is happening in their businesses even while on the road. The iPhone 2.0 SDK was only launched a week ago so while we have ideas to what we want to do, we are still evaluating the feasibility of what can and can't be done. But yes, obviously data capture is high on our list. and they prefer the iPhone over the iPod touch, because it'll work even without WLAN-access. Until there is a true 4D-Client for the iPhone, the Addressbook might be an instant solution for data capture and update, and doesn't need a 4D-webserver. The catch is to enhance the addressbook-fields using labels of your own. Adding labels to the default address-card is shown in the picture at the right (the picture zooms). This might be a politicians OSX-Addressbook with enhancements: whom to call first, who drives the car, who does the office and whom else. 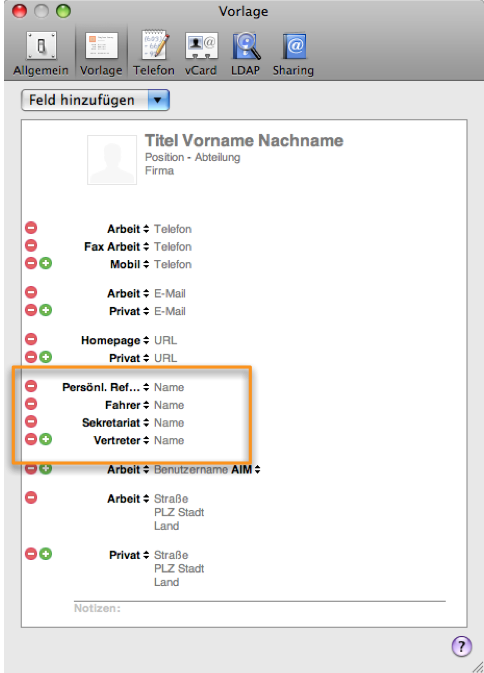 This is easily done, adding custom labels to the fields. Getting it to work means to use vCard as an intermittent format. vCard is tagged-text using a variable item-count. Since version 3.0 the pictures are transferred into vCard-format, too - if you checked that option in the preferences. Here is the workflow that works: the iPhone synchronises with the Addressbook. From the Addressbook you Drag&Drop one or many addresses to the desktop which creates a vCard-file. Then 4D imports the vCard-document, interprets the contents, creates new records or updates existing ones. 4D can recreate a picture from the vCard. Back to the iPhone means: export from 4D, import into Addressbook and synchronize to the iPhone. This method is simple, effectiv, available today and customers are quite happy. This is the idea. 4D has everything you need to build and establish that workflow - no plugin needed. It'll take some time to get it running. But why invent the wheel again? 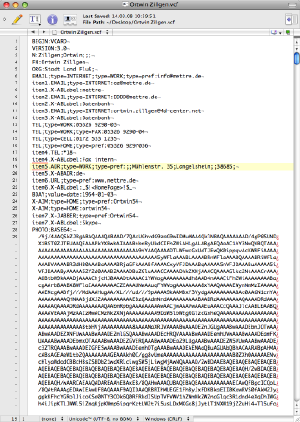 This is one single method OZ_vCard. This method does the import and the export and everything else. All you need to know is the two calls: OZ_vCard ("Run_Import") and OZ_vCard ("Run_Export"). The method needs to be adjusted for your data-structure - there is no one-solution-fits-all. That's reasonably easy. If you need support, I offer Online-Coaching and that works really well.